So how are the most recent U.K. economic figures holding up? Do they still support a future rate hike? Time to find out! Forex Gump! Forex Gump! That’s nice and all, but what the heck does that even mean? 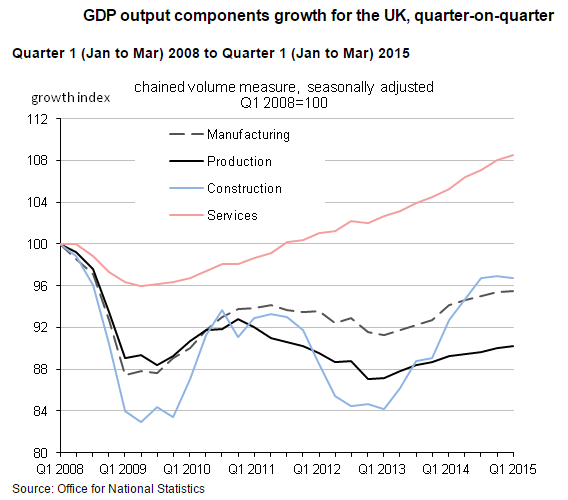 Basically, the ONS is saying that they are using a different statistical model for interpreting data that affect the construction industry and gross fixed capital formation. What is this “gross fixed capital formation” jargon, you ask? Oh, that is just economic-speak for net investments in fixed capital such as roads and buildings. Easy peasy, right? But it sure makes one wonder why economists bother to use such high-falutin’ words, huh? Okay, back on topic. The Q1 reading marked the 9th consecutive month of economic expansion, and that’s a very good thing. Looking at the components, it’s clear that the service sector is the main driving force for the growth in terms of relative output. Also, construction has been picking up the pace while production has remained mostly stagnant, although manufacturing, which is a key sub-component of production, appears to be seeing a pickup in the recent quarters. Year-on-year, GDP grew by 2.9%, much better than the 2.5% forecast. When it comes to the trade balance, the deficit widened from 10.6 billion GBP in Q4 2015 to 13.4 billion GBP in Q1 2015, as imports rose by 2.3% while exports only rose by 0.4%. 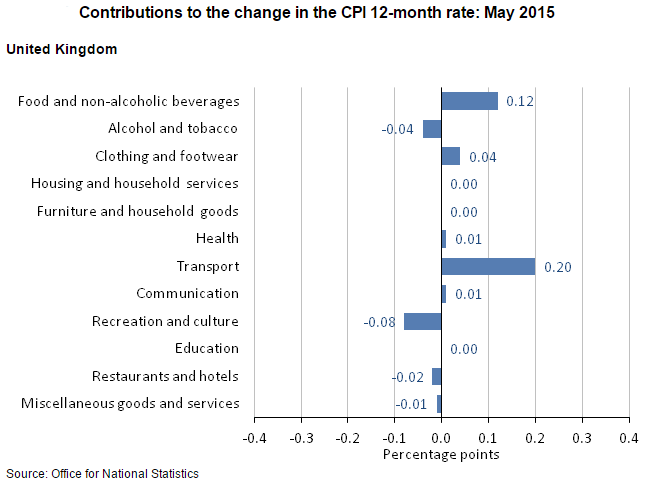 The latest inflation report shows that headline CPI rose by 0.1% in the year to May versus the 0.1% decline in the year to April while core CPI for the same period rose by 0.9% (0.8% previous). Transport services, particularly airfares, were the largest upward contributor to headline CPI due most likely to the Easter season. Recreation and culture, meanwhile, was the largest drag as computer games and computer equipment became cheaper. I guess there were a lot of summer sales, huh? As I discussed in my recent Global Jobs Update, the jobless rate for the February-April reporting period remained unchanged at 5.5%, but went down from 6.6% on a year-on-year basis. 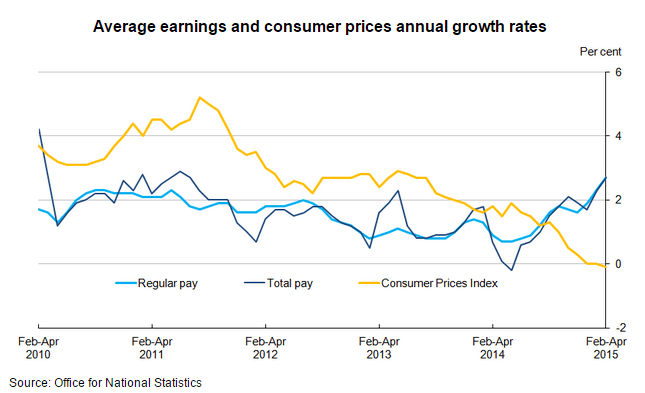 As for the average weekly earnings of regular employees, it went up by 2.7% (2.3% previous). The wage growth becomes even more significant if you consider that CPI fell by 0.1% in the year to April 2015 since that means buying power increased further. 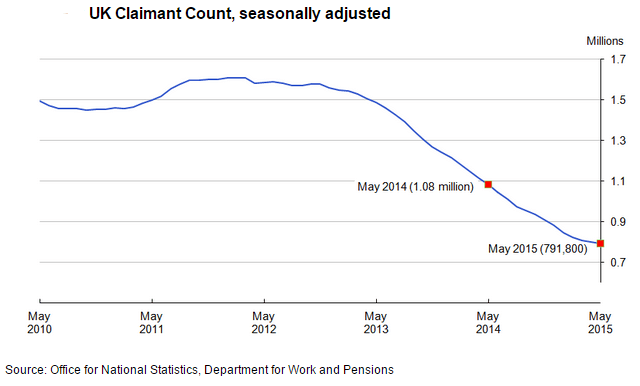 Claimant count change was disappointing, though, given that it decreased by 6.5K in May. Just as disappointing is the fact that April’s reading was revised to a 7.8K decline from a 12.6K drop. But it’s all good because a drop means less people are claiming unemployment benefits. The historical trend is a bit worrying, though, since the drops have become smaller and smaller. Markit’s manufacturing PMI for June fell to 51.4 (51.9 previous), its 26-month low, due to subdued demand from Europe and a strong pound. Still, it’s been above the 50.0 mark for 27 consecutive months now, indicating that expansion is still steady. On a more upbeat note, June’s construction PMI jumped to 58.1 from 55.9, thanks to a pickup in residential activity. Also, this was the fastest expansion in four months. Overall, the most recent data appear to be very robust. Perhaps the most noteworthy data point is inflation and how it jumped back into positive territory after a short decline. Also worth noting is how wage growth outpaced inflation because that would likely contribute to even more consumer spending in the long run. So what does this mean to forex traders? Well, it means that the pound is fundamentally-strong, which could translate to more demand as Forex Ninja suggested in his latest CFTC COT Positioning Update. I have two concerns, though: (1) the manufacturing sector is getting hurt by the appreciating pound and (2) the financial stability report states that aggregate U.K. household debt to income remains “high compared to historical and international norms.” This raises some concern since a debt-fueled growth is inherently unstable.